This week is the end of an era at the Warren Tech Center. 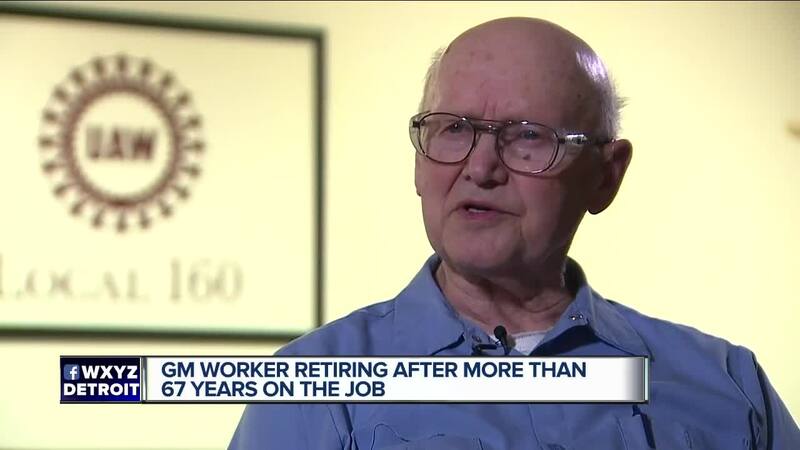 A man who has worked there for more than 67 years will say goodbye to co-workers as he retires. The UAW says Elmer Zurakowski is the highest seniority hourly employee in the all of General Motors. Mr. Zurakowski stopped at his local UAW hall before coming in to work on Wednesday. WARREN, Mich. (WXYZ) — This week is the end of an era at the Warren Tech Center. A man who has worked there for more than 67 years will say goodbye to co-workers as he retires. The UAW says Elmer Zurakowski is the highest seniority hourly employee in the all of General Motors. Mr. Zurakowski stopped at his local UAW hall before coming in to work on Wednesday. There they showed him a plaque made for him by his co-workers celebrating a more than 67-year-long career. “Well I started working when I was 18-years-old. I became a die maker apprentice. This was at Plant 23 in Detroit,” recalled Zurakowski. It was 1951. He remembers as he started the job seeing workers building tanks for the Korean War. He was ready to learn. “When I started the apprenticeship I wanted to go into the wood field. They said according to your tests it shows you would be better working with metal than wood. I didn’t know anything about metal, but growing up on a farm I used wood all the time. What they did, I think, they needed more die makers than wood pattern makers. But I went along with that and I was very happy with it,” said Zurakowski. The work at General Motors supported his family. He and his wife had a son and three daughters. He says he is going to miss seeing his co-workers everyday. “We have interesting people. There are natural teachers in there. It is an interesting place to work,” said Zurakowski. Notably Mr. Zurakowski is a member of Mensa International, the high IQ society. He says his long career was rewarding because he chose to find purpose in each days accomplishments. “If you don’t get your pleasure out of your work, you are never going to know what pleasure is. If you think you are not having fun, start thinking differently,” he said. In his retirement he is looking forward to focusing on his woodworking hobby and spending time with family.